This was painted plein air on a 30-degree day under the tree at the front of our house. 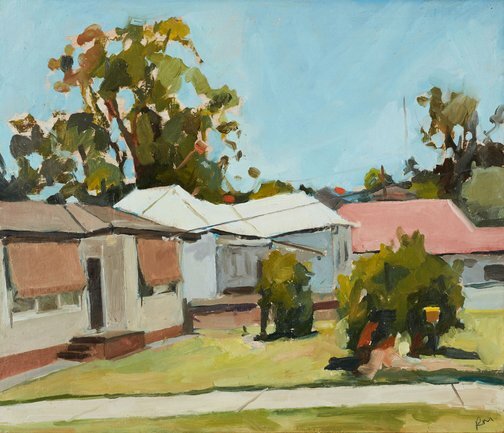 Suburbia is my current habitat and I’ve found the landscape has all sorts of connotations – peaceful, boring, sinister, safe. The houses on the street look similar, though on closer inspection are fiercely individual, colours of roofs differ but complement each other and the trees loom above, suggesting a balance between the human and natural world. I feel it’s my job to encourage intense observation of the world, to take a normal, familiar view and attempt to point out the interest, the beauty in the ordinary.